Are you tired of cooking for yourself? Maybe you don’t have the time to cook because of your busy lifestyle, including your job and family obligations. Maybe you’re concerned about the kinds of foods you and your family are eating. Maybe you want to lose weight, but don’t have the time to eat right. Whichever it is, there are a number of take-and-bake options available these days. They’re perfect for busy people! Each provides fast, healthy meals to go. Here we will explore 5 meal delivery systems at depth, and mention a number of others that may also be worth considering. They ship gourmet meals to your home or to another address — if you want to send meals as a gift. These meals are meant for families and discerning eaters who want the convenience of gourmet food without the trouble of actually fixing it. The meals are frozen, which can be a definite downside. And delivery drivers will not leave a package with meals if there is no one to sign for it. One nice thing is Send-A-Meal provides both a quick method of heating up the food, and a more traditional method. So if you are in a hurry, they could be a good choice. Unfortunately, the meals are quite expensive. For example, a traditional lasagna meal for a family of 4 costs almost $45. If you made it yourself, you could probably do it for $25-$30. Most of their food does look good though. And even though it is touted as gourmet, many of the meals look to be family favorites. They take a different approach than the meals to be delivered routine. Instead of delivering the food to you, they open their kitchens, provide the ingredients (all the prep is done for you ahead of time) and provide the recipes for you to cook meals on their premises. It’s quite clever in that you get to have all the fun of cooking homecooked meals without having all the clean-up afterwards! Supper Thyme employees clean up your mess for you, and you get a home-cooked, freshly made meal for your family. A typical meal only takes about 10 minutes to get ready, so you could make up to a month of meals in just 2 hours, according to their website. The only drawback is the fact that they only have locations mostly on the east coast, with a few exceptions. Since it’s such a great concept, I would love to see them expand to the western United States! 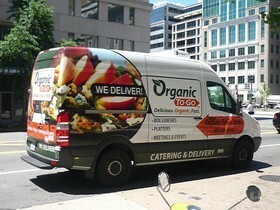 This is another meal delivery system, but not gourmet food so to speak. They claim to cater to just about everyone: working parents, dieters, singles, families, seniors and even people who are hosting dinner parties. To read their ads, it appears that they can be all things to all people. According to the testimonials, this DineWise lives up to the hype. Their largest customer base appears to be adult children who live far away from their parents but still want their parents to be eating healthy. Having meal packages delivered to seniors is a great idea! The diabetic meals are also quite popular. While they can be expensive (one of their diabetic meal plans cost from $199 up to $399), many customers seem to think the cost is worth it. These “neighborhood delis” are a franchise of restaurants that cater to those who want to eat healthy, but not lose out on eating their favorite foods. The owners of the franchise recognized the need to have a restaurant that provided healthy foods quickly, and they jumped to meet that need in their own community. They have since stuck to that idea and even provide catering services now to those who need them. The menu at My Friend’s Place is full of healthy foods including sandwiches and soups loaded with fruits and vegetables. From the looks of their menu you will not sacrifice taste in order to help you eat healthy! It’s a nice concept, but they are only in a few states in the south, including Georgia, Tennessee and Mississippi. Now if I could just find one of these in my neighborhood! Nutrisystem is quite popular these days. Supposedly, just about everyone who is anyone and is a celebrity is trying Nutrisystem’s food in order to lose weight. With Nutrisystem’s food delivery program, the portions are already fixed for you, as are the carbs — so you get the right ones at the right amount. Each meal costs less than $3. The meals are delivered to your door, and they are frozen. The biggest problem I see with the Nutrisystem program is the idea of having to eat this food for the rest of your life in order to maintain your weightloss. In other words, you’re encouraged to become dependent upon it. It’s easy to see how this company could make a lot of money because after all only they can get your food just right so you lose weight, right? I don’t personally buy into this, especially since we are all quite capable of reducing our portion sizes and adding the right kinds of carbs to our own diets. They might be fast and provide a quick way to lose some weight, but I personally think anyone can do this on their own with a little discipline. Those are just a few of the many different business models for meals-on-the-go for busy people. Each offers prepared meals to your home or office, whether you’re just too busy to cook meals yourself or you’re seeking a weightloss alternative. In most cases, my feeling is they are too expensive to really justify the cost when I can do my own cooking at home for the cost of the ingredients alone. The ones that people appear to prefer the most are the ones like Supper Thyme that are local, where they can go and actually make and or prepare the food themselves and they know it will be fresh. The idea of frozen meals being delivered (no matter how “gourmet” it is) does not appear to be a favorite among those who’ve tried those programs.